Dallying In The Dirt, Issue #231--- The fall flowering Sedums are starting their contribution. A wander around the garden in late summer reveals a variety of delights and just maybe a few chores that need to be attended to. The fall flowering Sedums are colouring up beautifully contributing to the ever changing parade of colour in the perennial beds. Some things have multi season interest. The Clematis in the background has seed heads that are almost as attractive as the flowers were in spring. A few raggedly Iris leaves remind me that I haven’t quite done my Iris digging and dividing as yet and the time to do so is rapidly disappearing. It’s also time to be ruthless. The gorgeous Hydrangea leaves are on a plant that has only produced leaves for the past couple of years. It’s time has come and it will be making the trip to the compost heap. That will leave room to try something else. 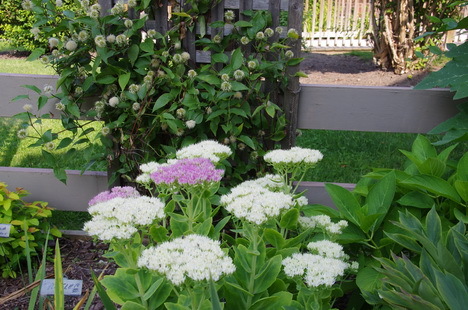 A few of the new varieties of Hydrangea macrophylla simply don’t live up to their advertising in terms of blooming ability both in my garden and in the gardens of many readers. One of the original hybrids, Endless Summer, does bloom reliably in my garden each year and it is planted almost adjacent to the two non blooming varieties. Since I’m complaining about plants that don’t bloom as they should, let me show you this year’s Morning Glories. 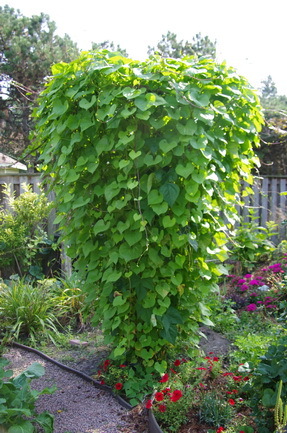 I always plant my two big trellises with Heavenly Blue Morning Glories, inter-planted with pole beans. They make a great combination and I love the true blue colour of the Morning Glories. One trellis was moved to a new location in the back yard this year where it is receiving full sun. The growth from the Morning Glories has been incredible but that huge mass of foliage, that you can see, only produces two or three blooms most days, when it should be covered with a mass of blue. There are very few beans growing in that mass because the rabbits seem to like to eat the bean plants and ignore the Morning Glories. I did give the plants one or two waterings with liquid fertilizer early this year when they were looking a bit poorly but the amazing growth and lack of bloom shouldn’t be attributable to just that. Obviously they like the full sun but what other factors are retarding the bloom. It’s mysteries like this that keep me gardening and wondering year after year. 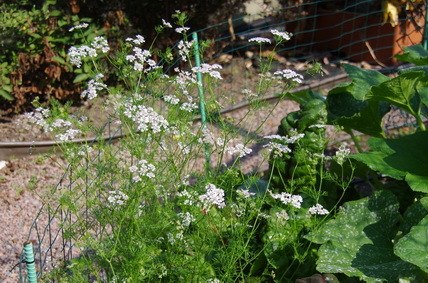 These lovely white lacy flowers are in the vegetable garden. They belong to the herb that is actually two herbs. Early in the year we use the leaves of Cilantro in any number of dishes. It is one of those herbs that evoke strong responses. People either love it or want nothing to do with it. It eventually produces these sprays of delicate white flowers and then sets it seeds. That is the second use. The seeds are the spice we usually call Coriander. It depends a great deal on where you are in the world, which word is used for various parts of this multi purpose plant but in most of N. America, the leaves are Cilantro and the seeds are Coriander. I will be collecting and storing the seeds in another week or two and I have been chopping the leaves into my salad dressings and vegetable stir fries, all summer. Barbara Asks? HELP!!! I have leaf miners on two, what were beautiful Viburnum Shrubs. These are terrible silent thugs and while I have battled them over the past two years - they are getting the better of one of the shrubs. This year was the worst and almost all of the leaves are shredded and I have noticed the areas along all of this year's growth now has hard little bubbles on the stems (eggs???) ughhhh! I think I can trim the stems back - but they seem to come back year after year! What can I do to defend the viburnums against theses terrible pests???? Ken Answers! I control leaf miners on my Camperdown Elm with nematodes. Check out,Natural Insect Control to see what they have. They will be very helpful on the phone if their website doesn't answer your questions.